A magical adventure and an all-new quest -- filled with action and irresistible humor. The moment Torrie meets the peddler Wren, he knows her talents are destined for more than the beautiful ornaments she makes from feathers and scraps of wire. When Crown Prince Liasis is kidnapped and no one steps forward to attempt a rescue, both Torrie and Wren realize it time to act. And so the two pick up the trail, even as the prince -- transformed into a snake and held captive by a sorcerer -- plots his own escape by winning a friend among his captor's goblin followers. Torrie and Wren travel through the mountains and into the Wild Forest, where they must deal with a goblin spy, an irate and deadly dryad, and the puzzle of Rookfeather the minstrel. And when they finally reach their goal, Wren learns surprising truths about herself and the strangely powerful ornaments she makes to sell. Therein lies the secret to freeing the prince and making him human again. 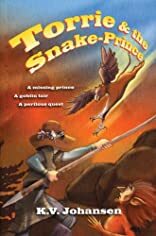 Torrie and the Snake-Prince is another magical adventure of action and irresistible humor in the exciting Torrie Quests series.